The Big Bang Science Fair is an annual event to promote the STEM subjects (Science, Technology, Engineering and maths) to children. It's a way of encouraging young people to study STEM and consider a STEM related career in future. 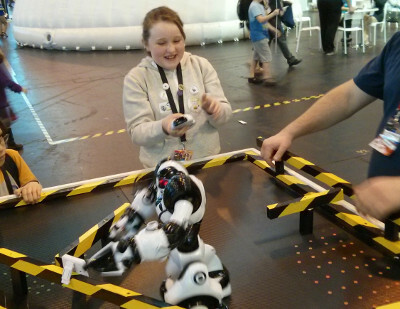 This years show was held at the NEC in Birmingham with smaller local events called "Big Bang Science Fair near me". The Big Bang is free to attend, although you do need to register in advance and there is a £10 car park charge if travelling by car. One condition though - this is an event for children so you will not be able to attend unless you have a child with you or are a young student. It's aimed from age 7 upwards, I went along with my 8 year old daughter. It's a great way for children and young adults to be enthused about science and would also be a good place to visit if thinking about what to study in future education or at university. The event uses two halls in the NEC with a huge variety of different exhibitors covering different areas related to the STEM subjects. Many of these have hands on activities from "making snot" (yes you did read that correctly) to controlling robots and taking part in science experiments. I had decided that this was an event for my daughter and despite my natural instincts to go to the stands that I was interested in I was just there to support my daughter. I even told my daughter "This is your day, you are in charge and get to choose what we see". I did encourage her to explore both halls to make sure that she saw everything that was on offer (there was so much available), but I pretty much stuck to that. It was still a great day for me as I was interested in much the same stuff as she was, and I even got to join in with a few activities, especially where it involved two or more working together. 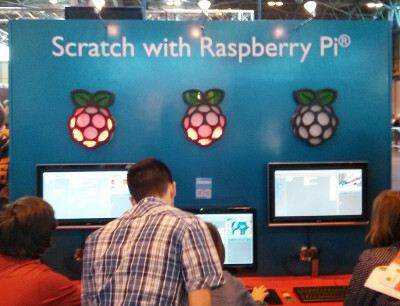 It was good to see some Raspberry Pi computers in use on some of the stands including an introduction to Scratch and the odd Raspberry Pi logo turning up on various exhibits around the fair. My daughter certainly enjoyed many of the hands-on exhibits. 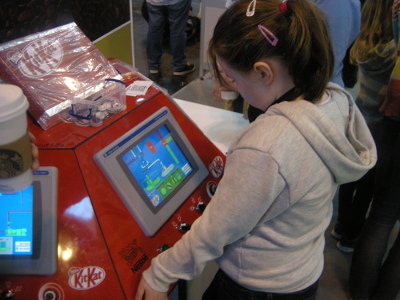 Two of her favourites were the Kit-Kat factory interactive computer game and an algebra based electronic puzzle, both of which she went back to. She also got some hands on with a couple of different robots which she enjoyed. It was obvious to see why she liked the Kit-Kat factory as it combined a fun computer game with some hands on dials and knobs. I was a bit more surprised by the Algebra activity, but I think the flashing light and prize at the end may have helped; it was a great way make maths fun. Some of the activities were very popular and so there was a bit of waiting involved, but most queues were reasonable and if not then we just moved on to other activates. It is a very large age range to cater for, but most stands handled that really well. There were a few that I thought were a bit too old for her, I won't name any particular exhibitors as the one example I am going to use did have other activities that were more appropriate, but Newton's 2nd law was a bit advanced for an 8 year old. There is catering available within the NEC, but it is fairly expensive and had long queues. There was also an indoor picnic area where we ate our own lunch. Saving the best until last, there were several shows running throughout the day, but the only one we actually went to see was Kaboom. 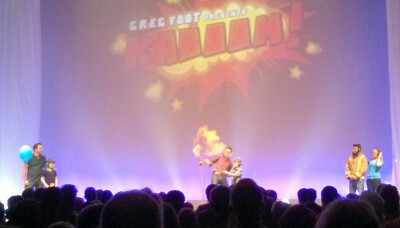 It couldn't be a "Big Bang" fair without some loud noises and Kaboom didn't disappoint. Not only did it have bangs, but it had big flames, canons and fireworks. 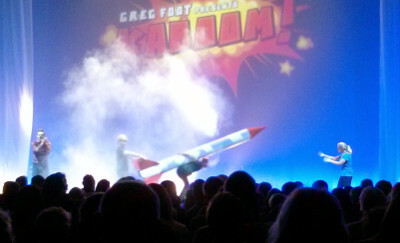 There were 3 great presenters that put together an excellent show covering a bit of history and the science behind gunpowder, fireworks and explosives. The Big Bang Fair is educational, fun and free (except for the car parks). There was lots to see and do and we didn't manage to get around all of it. It's a great event which I would highly recommend for next year.